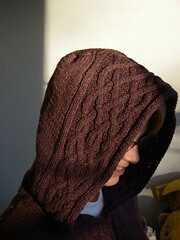 This is the popular Rogue hoodie, which lots of folks have been knitting over the past two years. I started this in October, and finished it on New Year’s Day. Yes, it was a lot of work, and for you economist non-knitters, this is a good pattern to illustrate the extent to which knitting truly is a mathematics hobby. Lots of axial and radial symmetry, and spatial logic. Plus it’s beautiful and comfortable! More pictures, taken on a gorgeous winter day in Chicago, after the fold. Note the gorgeous Victorian buildings in the background; this is Armitage Avenue, one of the nicest streets in Chicago for strolling, boutique shopping, café-ing, etc. Just to make sure it’s clear that we are in my fabulous hometown! Showing off the side detail and the gorgeous plummy color. Good work on the hoodie. As the taker of these particular shots of le hoodie, let me say that they don’t do it justice. It rocks, as of course does its lovely model. Thank you all for your lovely comments! Stephen, we were on the southbound platform, which doesn’t lend itself quite so much to arty light shots. And our train was coming.